Gary Shore"s Dracula Untold (2014) has seen a lot of directors before settling in the hands of Shore but hopefully Shore has nailed the script. Universal Pictures wants to tell the tale of Dracula before becoming the legendary vampire Dracula. Dracula Untold will tell the story of "a young prince who, when the lives of his wife and child are put in danger by a bloodthirsty sultan, risks his soul to save them, and in the process becomes the first vampire." The official trailer should not be long behind with the October 17, 2014 release date nearing closer. Dracula Untold stars Luke Evans, Sarah Gadon, Diarmaid Murtagh, Dominic Cooper and Samantha Barks. 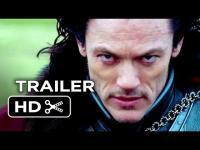 Update: Dracula Untold (2014) is now releasing one week earlier than the original release date of October 17, 2014. Dracula Untold will release in movie theaters this October 10, 2014, I am so excited to see this vampire film with Luke Evans as vampire king Dracula. Synopsis: The origin story of the man who becomes Dracula.